Geronimo Stilton, fraidy-mouse extraordinaire, is traveling to the Wild West! Geronimo is the editor of the local newspaper. He is a calm mouse. He is a mouse who enjoys sitting at home, listening to classical music and drinking a nice cup of hot cheddar cheese tea. 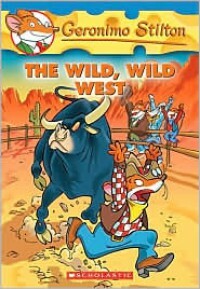 Geronimo learns to rope and ride in the Wild West and he stands up to the town bullies. In the end ... well you have to read the book to find that out.I enjoyed reading this Geronimo Stilton book as it addressed Native American tribes to some extent, delivered great vocabulary regarding horses, and actually threw in a little twist at the end. Stilton fans will love reading this book.